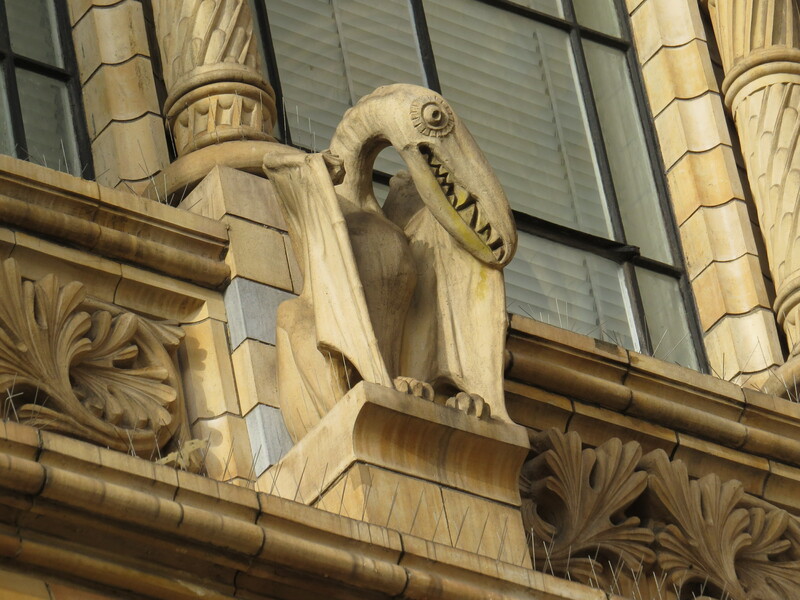 Dear Readers, I have always had a love-hate relationship with the Natural History Museum in London. 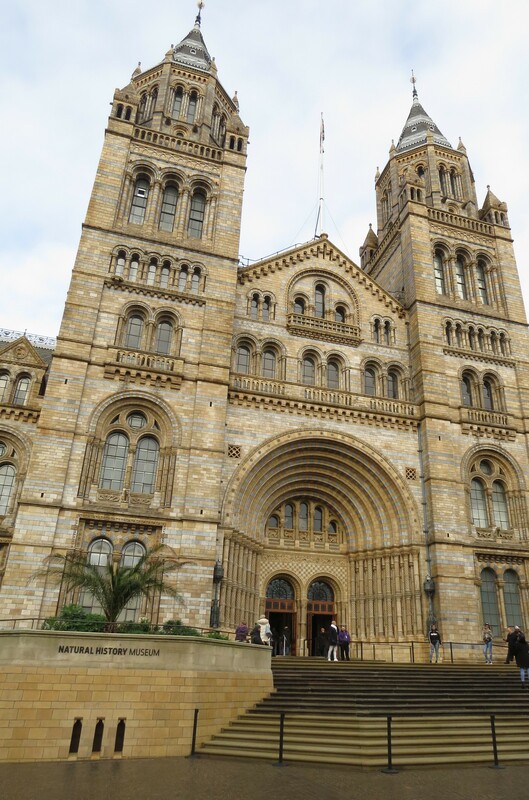 I love the building that houses the collection of over 80 million specimens; it has been described as a ‘cathedral to nature’, and it certainly repays close inspection. The outside is clothed in a mixture of pale blue-grey and golden tiles, and everywhere you look, there are animals and plants. 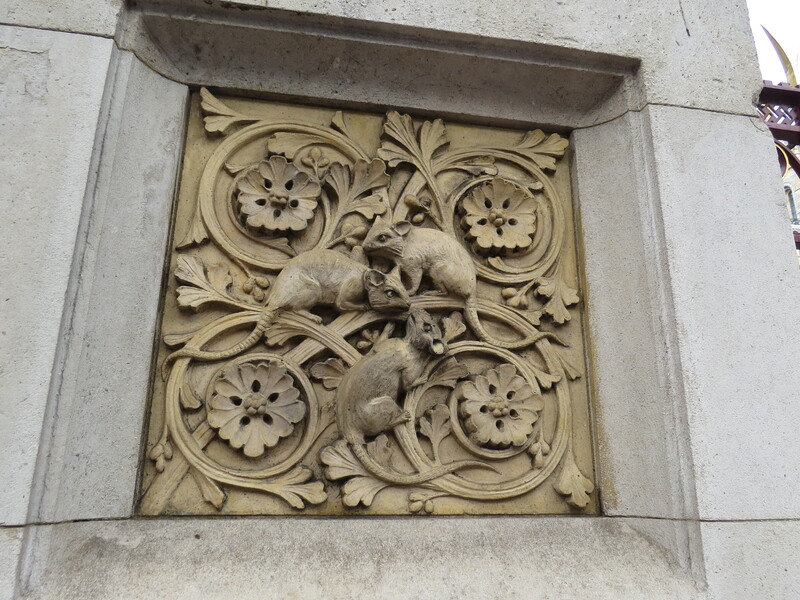 The entrance gate is decorated with reliefs of different creatures, and I particularly liked these rats. And how about this cobra? I think that you could have a delightful time just looking at the decoration of the building without even going inside. 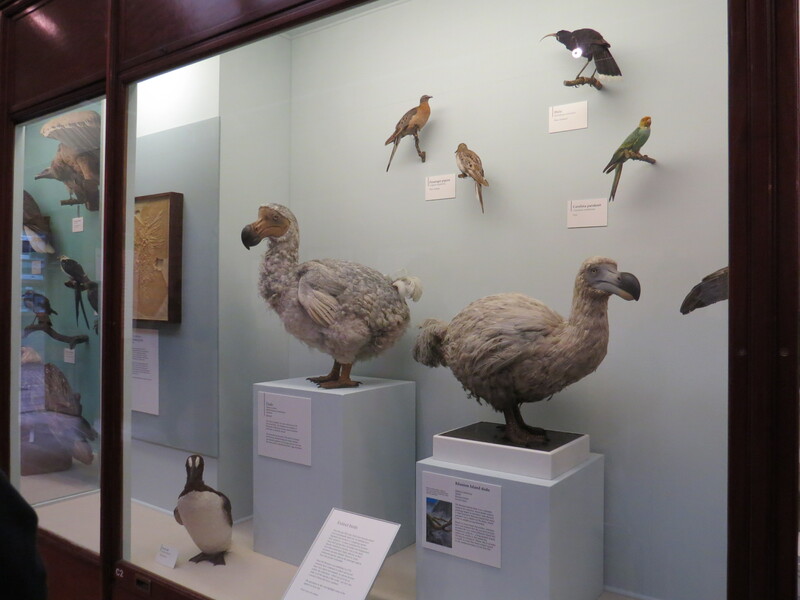 The east wing is decorated with extinct animals, and the west wing with living species, at the request of the Director at the time, Richard Owen. It can be seen as a rebuttal to Darwin – Owen was unconvinced by Darwin’s theory of evolution as it stood, and wanted to show the separation of extant and vanished species, rather than their continuity. We can just enjoy being looked down on by rather menacing pterodactyls and sabre-toothed tigers. 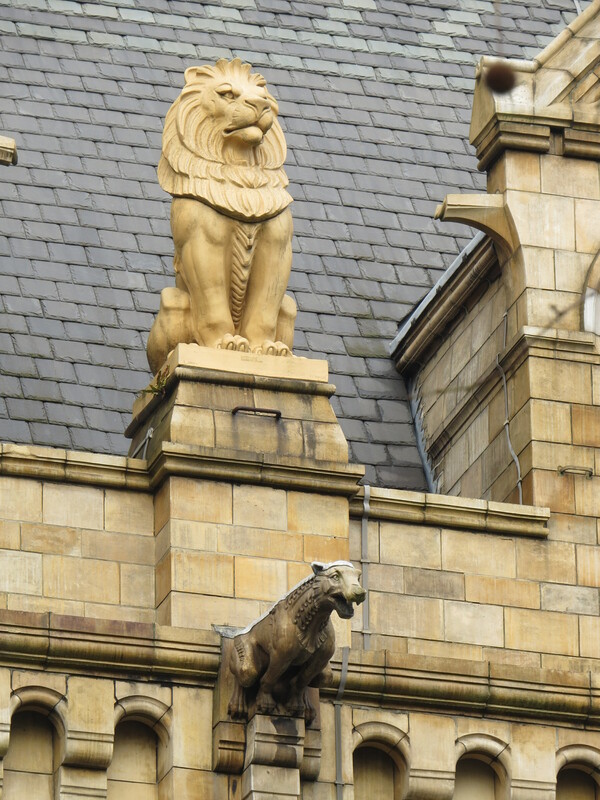 The west wing features a few more familiar creatures, such as this splendid lion. It’s not always so straightforward, though. The animal below is some kind of extinct mammal, but to the left there is what could easily be a coelacanth, a lobe-finned fish that was thought to be long vanished from the oceans until one was hauled up in 1938. 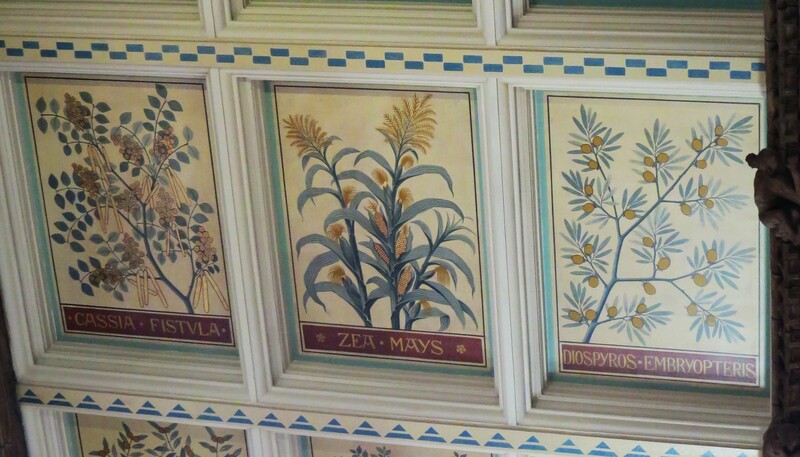 The decoration inside the museum is just as ornate. 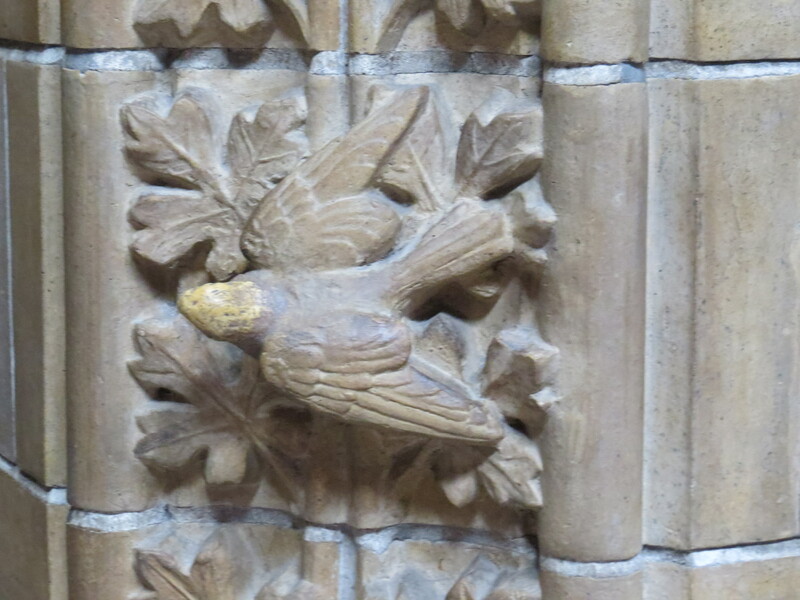 In the entrance hall, each niche is decorated with birds who forage up and over the arches. 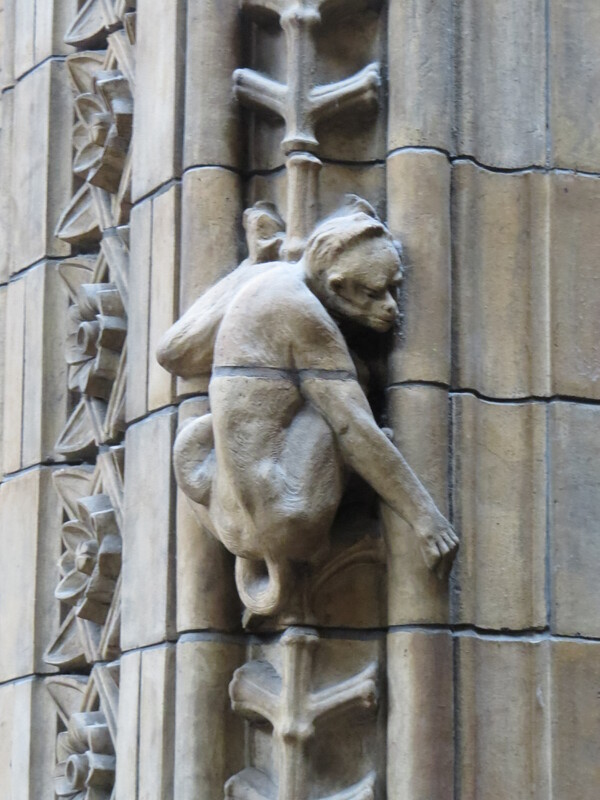 As you go upstairs, the birds are replaced by monkeys clambering through vines, though they look rather more like little people to me, especially with their unnervingly human hands. 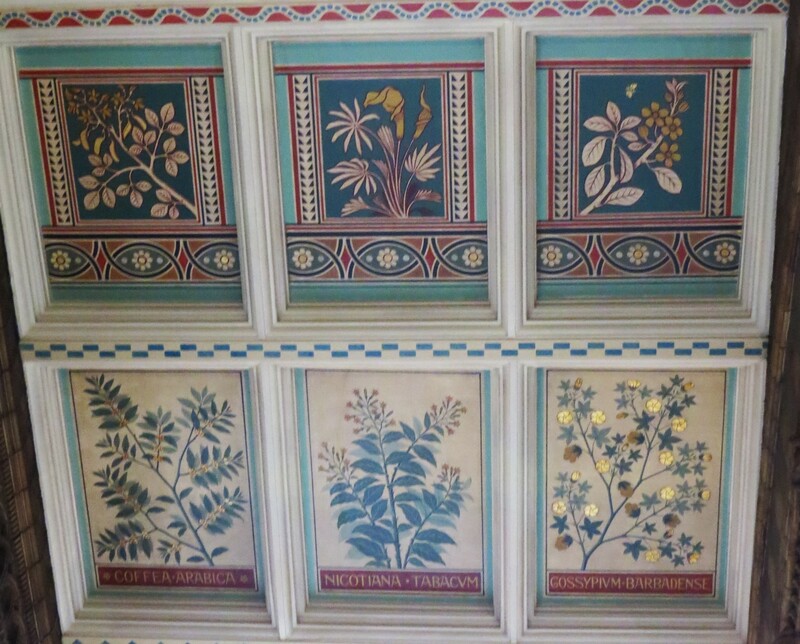 One of the wonders of the Museum is the ceiling of the Hintze Hall, which contains illustrations of plants from all corners of the world. With typical Victorian practicality, these are mostly ‘useful’ plants, such as coffee and the opium poppy. So, really, what’s not to like? Well, as a child I was always extremely upset by all the dead and mounted animals, frozen in the act of flying and foraging and yet never to move again. On more than one occasion I had to be taken outside because I was so upset. It’s true that I was a tender-hearted child, but I suspect most children are this way, until they become inured to our ordinary cruelty. I remember the Victorian display below from the first time that I saw it over 50 years ago, and it still disturbs me today. 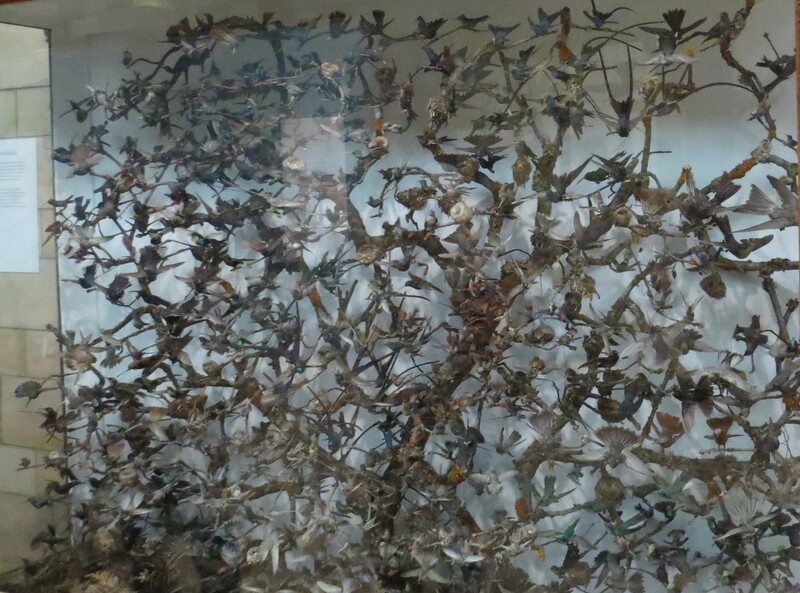 There are over a hundred separate birds in this case. The work to prepare and mount each of them must have been enormous. The species are not listed, and so this is purely for the delectation of those who stopped to admire it. I have no idea how quickly their colours faded, but the light in their eyes would have gone out quickly enough. To the Museum’s credit, there are far fewer of these nineteenth century displays than I remember. 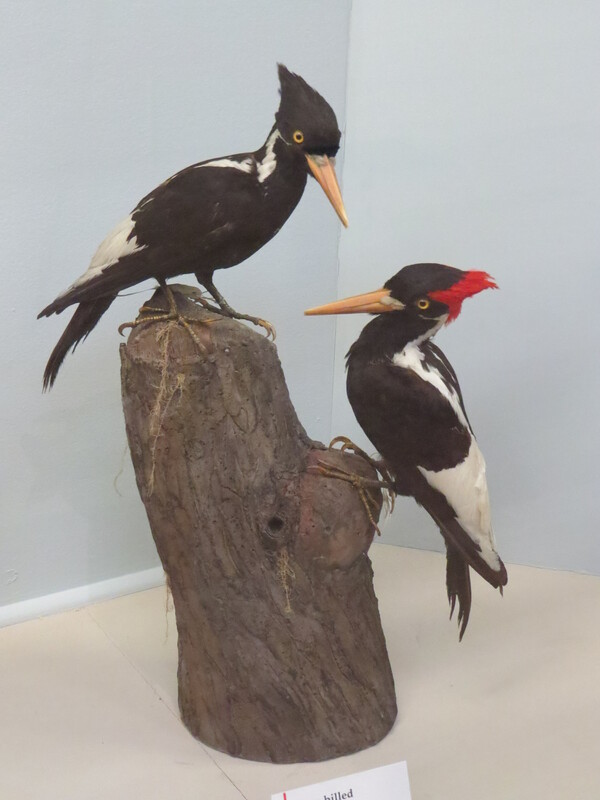 There are also dodos here, and a pair of ivory-billed woodpeckers, last seen in the wild in 1944. 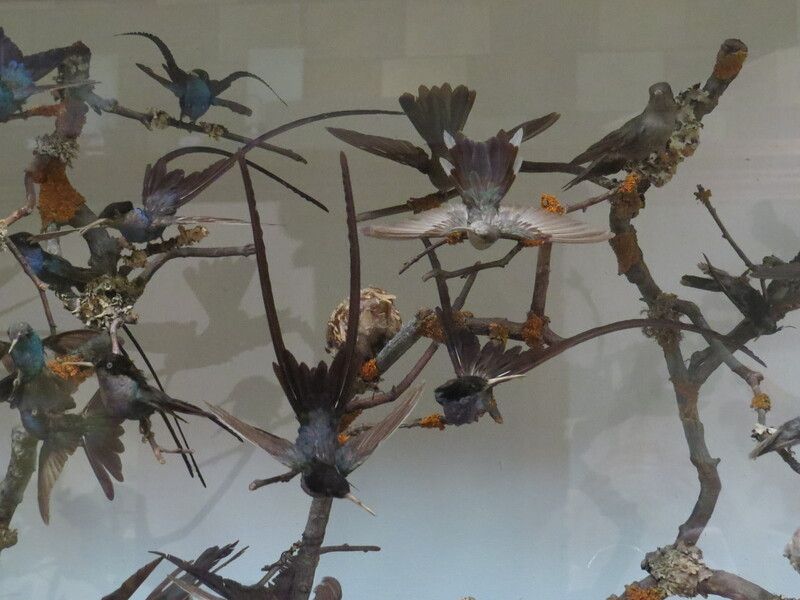 Habitat destruction and hunting doomed both these species, and this is all that is left, a few stuffed birds in a glass case. But, things are changing. The Museum hosts the Wildlife Photographer of the Year competition, which gives visitors another way to view animals and to wonder at their complexity and beauty without harming them (though there is a discussion to be had on ethical wildlife photography as well). Many of the specimens that have already been collected are housed in the Darwin Centre, where they provide invaluable information for scientists, especially with regard to assessing the changes in distribution due to climate change. 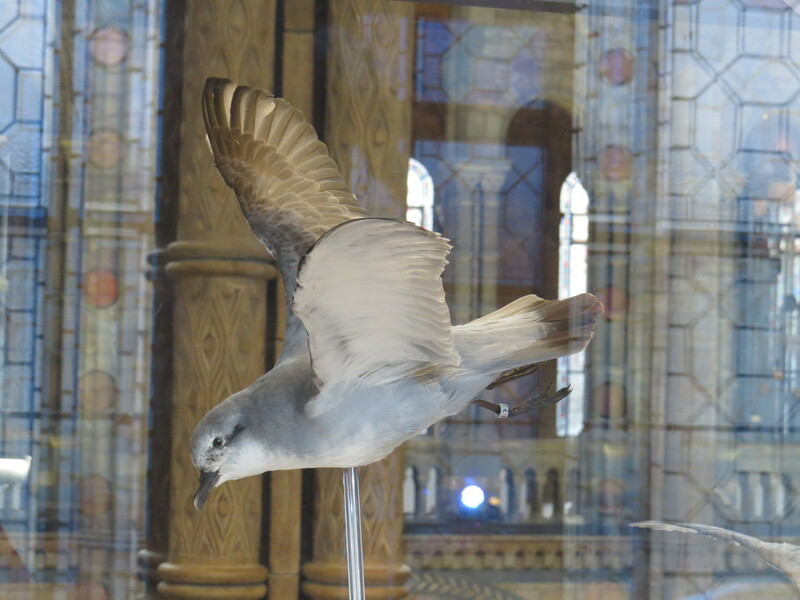 Existing specimens are also used in the exhibitions on different aspects of animal and plant life, such as the current exhibition on nocturnal animals. This move away from collecting for the sake of collecting and towards conservation is best exemplified by the change in the entrance hall of the Museum. 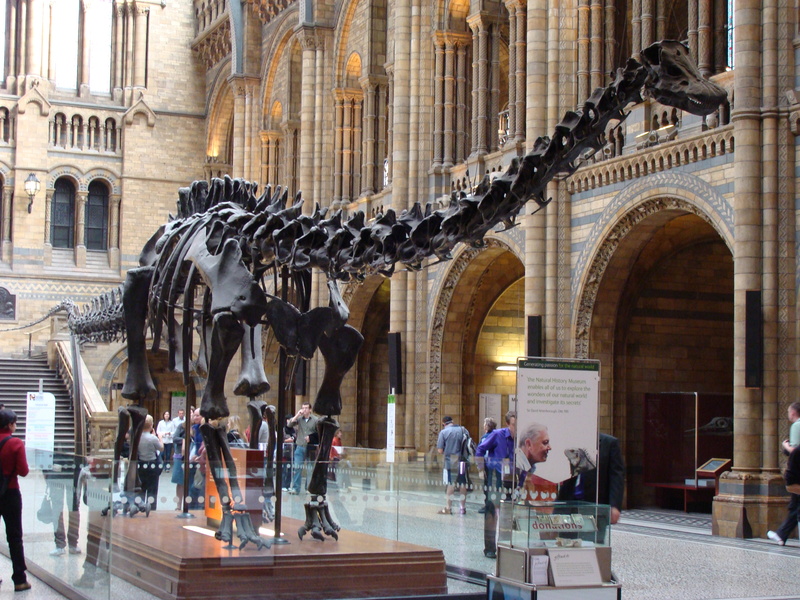 Until recently, the entrance hall housed a cast of the bones of Dippy the Diplodocus, and this had been the first thing that visitors saw when they entered the Museum since 1905. 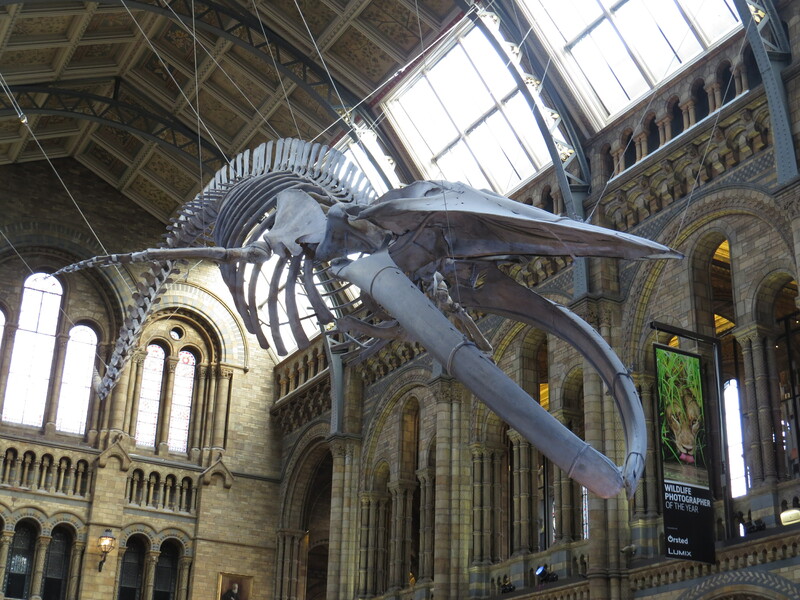 However, they have recently gone ‘on tour’ and have been replaced by the skeleton of a young blue whale, who was found stranded in Wexford Bay, Ireland, after being injured by whalers in 1891. 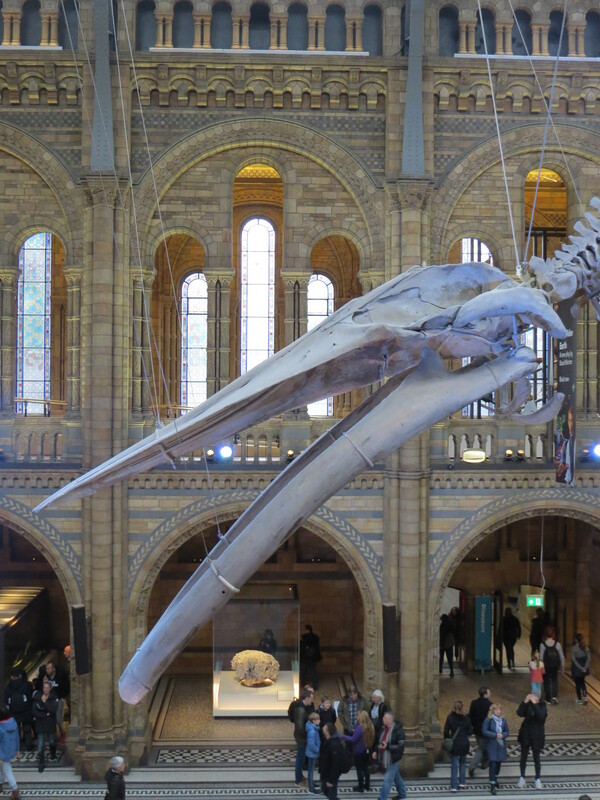 The bones have been in storage for all this time, but in 2017 it was decided to replace the dinosaur with the whale. This is a stunning creature, 25 metres long, and it seemed to gaze down on me as I entered. 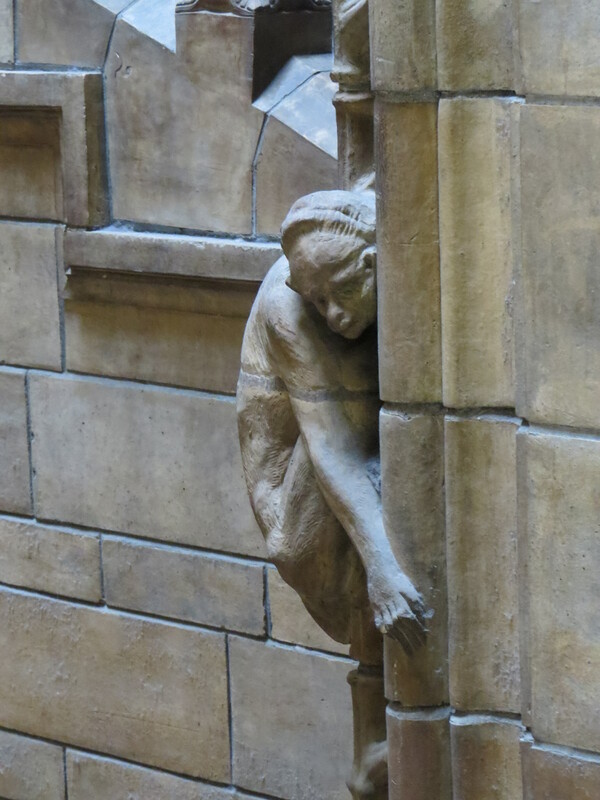 The work of getting it into the hall was detailed in a recent BBC programme which I watched with great interest, but nothing prepares you for its size and presence. My previous visits to the Museum gave me a sense of voyeurism, as I spent all my time looking at these long-dead creatures. There is something of a challenge about these bones, however. I had the distinct sense of being gazed down upon and evaluated by those empty eye sockets. This is the largest animal that has ever lived on this planet, and we treat the world as if it were our playground and rubbish tip. If the bones could speak, how much rage and sorrow would that voice contain? This entry was posted in Bugwoman on Location, London Places on January 26, 2019 by Bug Woman. words.The stuffed birds are very disturbing. It’s a beautiful building, but the whole place is pretty much a paean to the Victorian ideal of Man’s dominion. Indeed. I’m glad to see that they’re trying to change the perspective, but much of it is still difficult to take. And I was reading the Burns poem the other day, and thinking how apt it was…. 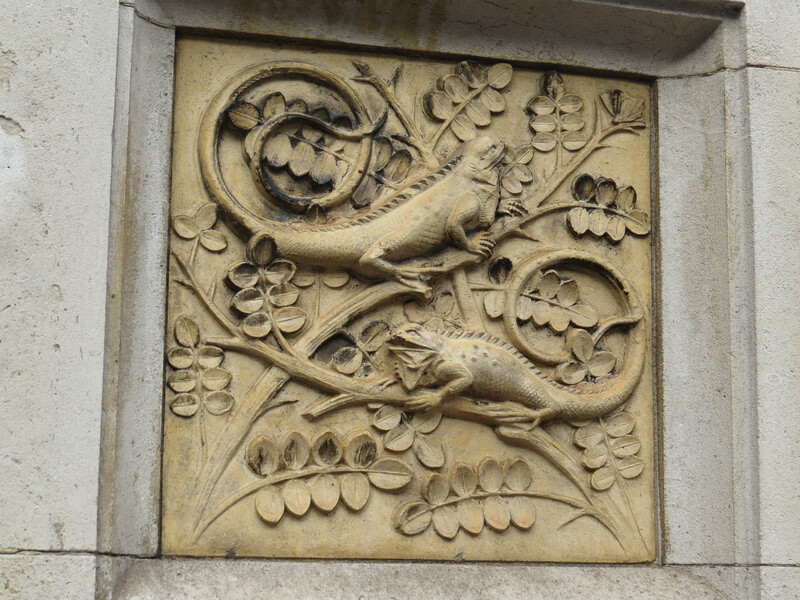 The carvings are wonderful. I haven’t been to the Natural History Museum in London but I felt the same when I visited the one in Newcastle, about all those dead and stuffed animals. Know what you mean all those beautiful birds stuffed and behind glass! 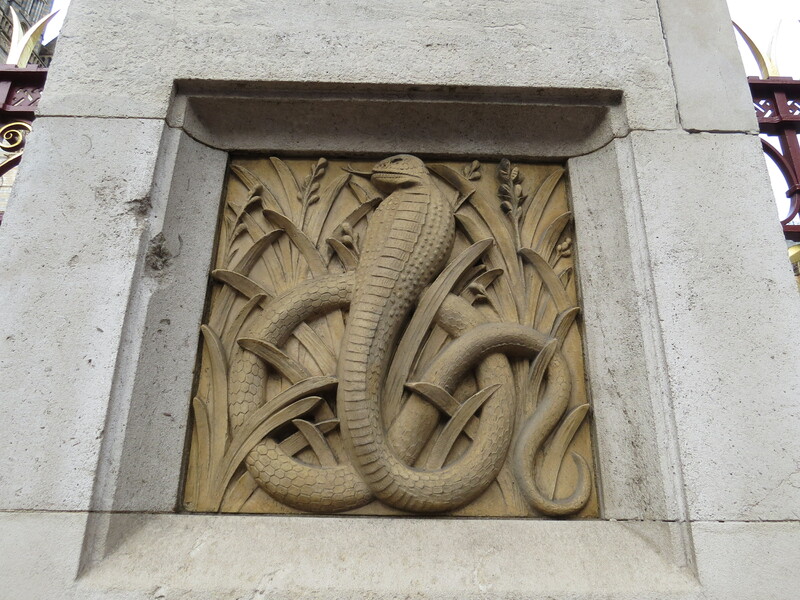 Love the building though and always find some sculptural details inside or outside that I haven’t seen before! Like the whale but did like Dippy better! Lovely photos Viv, it’s so hard to take good pictures as it is always so crowded! 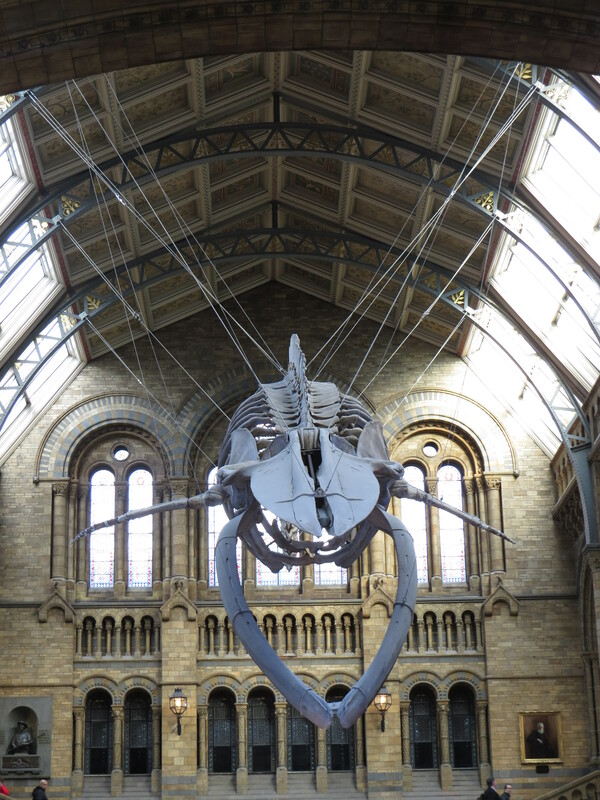 I’ve been to the NHM twice in recent months to do yoga under the whale (Sunday mornings, once a month, well worth it!) I hadn’t known the history of the skeleton… poor thing. I was taken aback by how sad I found all the stuffed creatures, too.. I don’t know how old I was when I went there, once only, but I wasn’t so keen on it either.